Anthony Jordan has put his finger on a very important component of Eamon de Valeras personality in this book, and if he has not quite penetrated to the core of the issue here, he has certainly given his readers a lot to think about.Jordan emphasises the specifically Catholic dimension in de Valeras thought and politics, and he has written the familiar life story having cast the religious issue as a kind of Ariadnes thread that stretches from the loveless cottages of Victorian Bruree to Aras an Uachtarain in the Seventies. 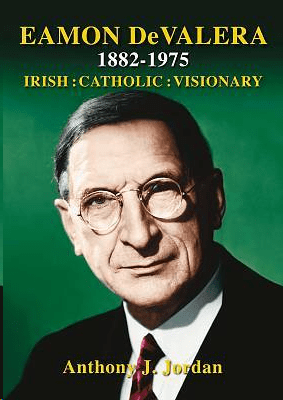 via Review: Eamon de Valera, 1882-1975: Irish Catholic Visionary by Anthony J. Jordan – Books, Entertainment – Independent.ie. Written by: Eoinpurcell on 23 January, 2011.